Learn how to create vector photo effect out of any image, clipart, graphics. 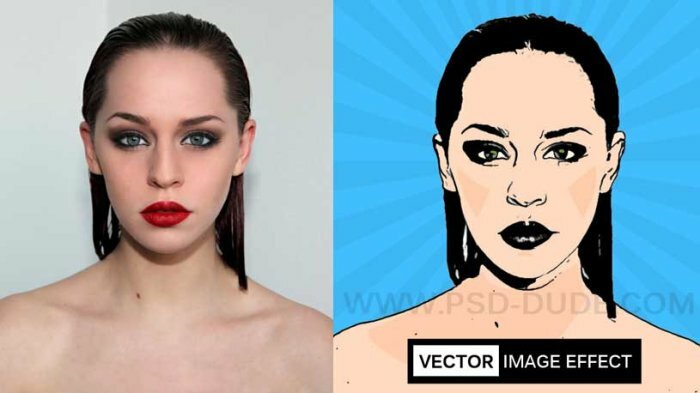 You can obtain vector ink photo effects in just a few simple steps. I am planning to automate these steps into a Photoshop action that you can easily use and customize. In the meantime you can use Photoshop adjustments and filters like Photocopy and Threshold to create this vector effect. Learn how to create a vector image effect in Photoshop in just a few easy steps. In this tutorial I am going to show you a simple way to create a image to vector effect using any photo/image/graphics/etc. In the next tutorial I am going to show you how simple it is to turn from photo to vector shape in Photoshop. So let's start with this girl stock image; you can use any image you want but if you want to create vector silhouetts the best are the photos with white/black background. Or better still you can use cutout images. Duplicate this layer and call the layers Girl 1 Layer and Girl 2 Layer. You can also keep a copy of the original layer. Go to Image>Adjustments and use the Threshold adjustment for the Girl 1 Layer. Set the level depending on your photo size, details, etc. Set the foreground color black and the background color white. Go to Filter>Sketch and use the Photocopy filter for the Girl 2 Layer. Set the blend mode of the Girl 2 Layer to Multiply and merge the two layers. Use again the Threshold adjustment for the new created layer. In this next tutorial you will learn how to turn the Photoshop vector effect in an actual vector image that can be resized without loosing quality and exported to Illustrator. 9 comment(s) for "Image to Vector in Photoshop"
hola, esto solo se puede con una foto que no tenga fondo?? osea si tiene fonto que pasa igual se vectorisa?? you can create the effect using an image that has a background with lots of elements; you will obtain a vector effect of the background as well. Very nice result and easy to create too! Can I convert it to vector like custom shape for example?